Throughout the year, airborne dust caused by processing, handling and road surface vehicle movements, which could potentially close an operation down if not addressed affectively, and be financially crippling to any organisation. Most larger organisations are accredited to ISO 14001 which incorporates environmental audits and planning to show that the company is environmentally friendly, reduces wastage and improves the company image. Control of dust emissions are an aspect of this that is taken into consideration. When companies are making planning applications for new sites or modifying existing permissions, the dust emissions from site form part of the considerations and in many instances, dust monitoring is stipulated as part of the planning consent. Most of the larger areas around the sites would tend to be controlled using water sprayed onto the roadways and stockpiles by sprinkler and rain gun systems or water bowsers on a regular basis depending upon the type of dust, vehicle movements and exposure to windy conditions. This dust tends to be a nuisance to both site and neighbours with low levels not of undue concern to health. However, there is growing concern over materials being handled with a higher level of silica content in the dust due to the potential health risks of both site staff and the surrounding areas. In these situations, it is essential that the emissions are taken seriously and control measures retained in perfect working order and staff trained to both minimise dust and to wear the appropriate protective clothing and breathing masks. Even within the company perimeter or enclosed buildings, dust is particularly unpleasant for employees to work in and the addition of dust masks with protective clothing sometimes makes manual work more difficult or uncomfortable. Staff also like to know that their health is not at risk and want as good a working condition as possible on site. This helps retain key members of staff for the benefit of both staff and the company. 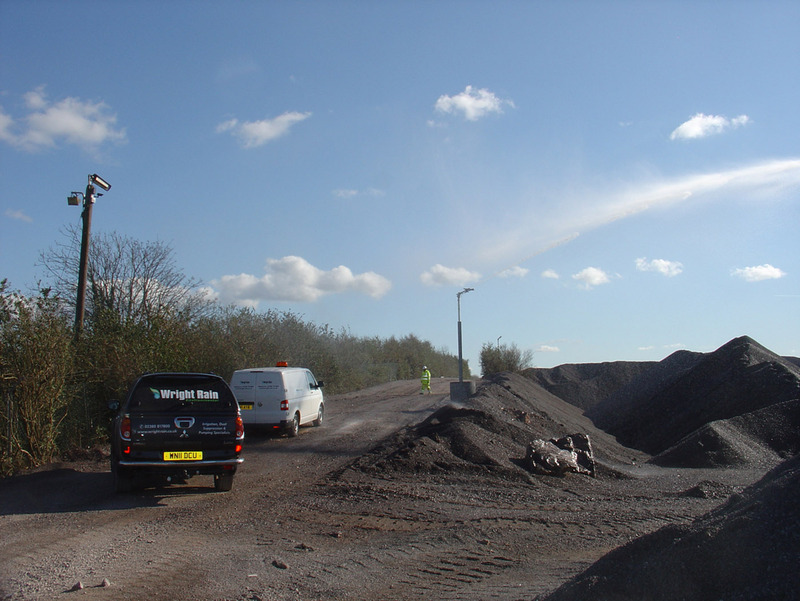 Wright Rain Environmental specialise in the design, supply and installation of commercial dust suppression systems for the aggregate and waste handling industries for over 20 years and our trained staff are available for system design, breakdowns and service throughout the year. This is the ideal time to be considering your requirements for this year whilst there is still time to service, install and modify systems ready for the drier weather this Spring.